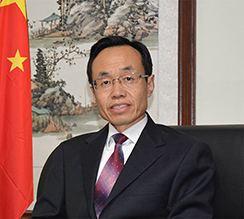 On December 6, Chinese Ambassador to Ghana H.E. Shi Ting Wang attended the inauguration ceremony of the diaper factory of Sunda Ghana Co., Ltd. and delivered a speech. More than a thousand people were present at the event including the President of the Republic of Ghana, H.E. Nana Addo Danquah Akufo-Addo, Minister for Trade and Industry, Hon. John Alan Kwadwo Kyerematen, the Greater Accra Regional Minister, Hon. Ishmael Ashitey, Metropolitan Chief Executive of Accra, Hon. Mohammed Adjei Sowah and other government officials, parliamentarians, New Patriotic Party officials as well as traditional leaders, people from the neighboring community and some representatives of Chinese enterprises in Ghana. In his speech, H.E. President Akufo-Addo recalled with pleasure his state visit to China and attendance to the Beijing Summit of the Forum on China-Africa Cooperation (FOCAC) in September this year. He said that he had established personal friendship with President Xi Jinping, which will greatly promote the economic and social development of Ghana. The people of Ghana witnessed the inauguration of another Chinese factory in Ghana, which will get rid of the plight of poverty and backwardness of the community. This fully demonstrates that Chinese companies are fully confident in Ghana's business environment and the governance. Ghana welcomes more Chinese companies to invest in Ghana. H.E. President Akufo-Addo thanked Ambassador Wang for attending the inauguration ceremony, which is a signal of high-level development of Ghana-China relations and urged Ghanaians to actively cooperate with China to show the warmth, friendship and self-discipline of the Ghanaian people. Minister for Trade and Industry, Hon. John Alan Kwadwo Kyerematen expressed his appreciation for China for supporting the "One District, One Factory" (1D1F) initiative, saying that Ghana will continue to improve the business environment and attract more Chinese investors to start businesses in Ghana. Ambassador Wang thanked President Akufo-Addo for attending the inauguration ceremony of the diaper factory and said that this project is the latest important achievement of China-Ghana cooperation under the frame of Forum on China-Africa Cooperation (FOCAC). China is the main source of investment in Ghana. China has invested large-scale enterprises such as the Sunon-Asogli Plant and African World Airlines (AWA). Private enterprises such as Sunda Group actively invested in manufacturing industries in African countries such as Ghana, making important contribution to China-Africa capacity cooperation. In September this year, the Beijing Summit of the Forum on China-Africa Cooperation was successfully convened. President Xi Jinping announced the "Eight Major Initiatives" of China's important measures for cooperation with Africa. China is willing to work with Ghana to implement the outcomes of the Summit to promote more Chinese investment in Ghana and make more positive contribution to Ghana’s social and economic development. After the ceremony, Ambassador Wang and President Akufo-Addo cut the ribbon for the diaper factory of Sunda Ghana Co. Ltd. and jointly inspected the production line. The phase I of the diaper factory of Sunda Ghana Co. Ltd. attracts investment of 40 million US dollars. It is estimated that the total investment will reach 55 million US dollars and create more than 3,000 jobs for local people. It is the largest diaper factory in sub-Saharan Africa.